I just ate 42 foods. Actually, I ate more than that because I just uploaded 42 pictures, and many of them contained more than one food. I’m also sort of speechless because every single food was out-of-this-world phenomenal. All of this deliciousness came my way tonight at the David Burke Townhouse, courtesy of a Foodbuzz event to celebrate one million posts. Those lychee martinis were teeny, so I had four of them. (Whoops.) I just get so excited about drinks that have real fruit! Plus, my first three did not contain any actual lychees. I had to go back for the fourth when I started to see the whole lychees floating around in other people’s drinks. As soon as we got the go ahead, Emily and I beelined to the back of the restaurant where food was waiting. Remember, I’m still speechless, so I will let the photos do the talking. I had more than you see in that picture, of course. I couldn’t let the chance for fresh lobster and fresh crab to pass me by! I actually didn’t finish that plate. It was too meaty for me, and I like my salmon more done. There were dumplings like this. Some had lobster, some had chicken, some had beef, and several had foie gras in addition to the other meats. I had at least one of each. And then the desserts began to come around. I kept myself to “one of each,” but one of each became far more than I had anticipated as more and more desserts rolled out of the kitchen! The malted milk had a very familiar flavor. Missy hit the nail on the head when she said it tasted like the milk leftover from a bowl of Fruit Loops. I only had a couple of sips because I can make that myself. I left the milk on the ledge and promptly knocked it over with my big bag about five seconds later. David Burke himself swooped in to clean up the mess. So, this was a scrumptious event that I got to share with several fun ladies who love food almost as much as I do! 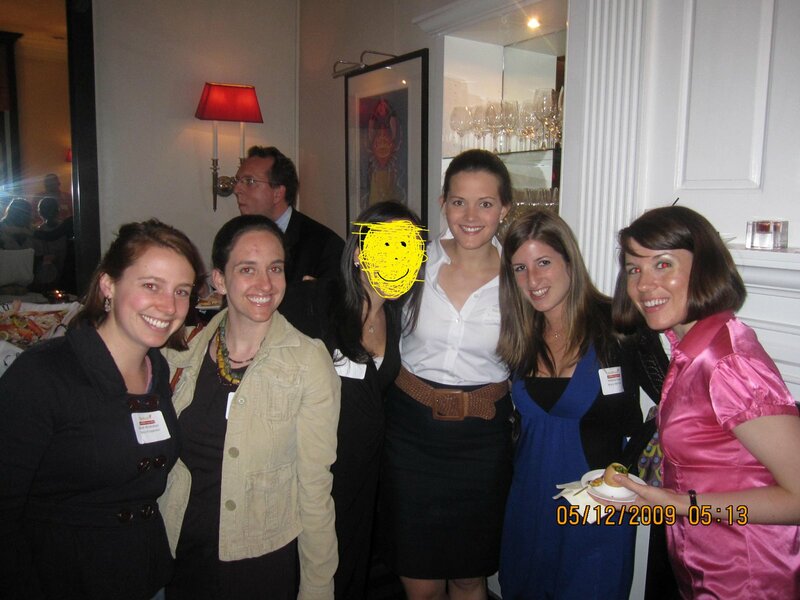 I hijacked this photo from Missy’s recap (which you should check because she has many more facts about the event and the restaurant): Me, Emily from Super Caloric Chalk Dust, Melanie from MelonCauliflower, Ashley from Healthy Happier Bear, Missy from Missy Maintains, and Diana from Soap and Chocolate. I’m so glad that Foodbuzz decided to celebrate one million posts and invite me. I just wish they could have invited the starving population of NYC as well since there was more food than anyone there actually needed. I always feel torn at events like this — awed and thrilled that I got to attend, yet overwhelmed and distressed at the excess! The thought of trying to comandeer all these leftovers was too much to handle at this particular stress-pinnacle of the semester, but I hope they went somewhere useful. And I hope thinking about it doesn’t keep me up tonight! What makes you feel torn? Wow…I can’t decide what looks best. I think my favorite is the pecan buns in the oven! wow how are your pictures so gorgeous? I hear you on the torn thing… my first thought was, “must. become. food. blogger. IMMEDIATELY!” and my second was, “Isn’t there a recession on?” But the food did look freakishly delicious. Oh, and happy birthday!! I wasn’t around the computer, but I’m glad you had a fabulous day, and your baking really does astound me! I am absolutely jealous on the other coast. I love David Burke and everything looks amazing! I can understand the concern about excess, but at the same time I am glad you enjoyed yourself!!!! could you do me a huuuge favor and block my face out of the group pic? What an event, what an event!! I would have DEFINITELY gone for those wasabi sticks….AND DESSERTS!! That little stove w/ the pecan-cinnamon buns are probably the cutest things I’ve ever seen!! I think it’s great that you have compassion for people who aren’t fortunate enough to eat at some gourmet buffet, but I’m glad you enjoyed yourself…and you deserved a great night! I’m glad you enjoyed it! And you have a great heart too! 🙂 I think us food bloggers should host an event one day with the proceeds going to an organization that feeds the hungry. Whether in North America or overseas! What a beautiful meal!! I feel the same way at events like that because there’s always SO MUCH food! Holy monkeys. That event looks spectacular! I cannot believe all that food!! Mmm! I’d feel torn about all that luxury juxtaposed with the starving population outside those walls, too. I’m not sure when I feel torn on a regular basis. I suppose dairy makes me feel torn, but that seems so superficial compared to starvation. By the way, the past couple days I had no fresh produce (ok, only a few items), and I totally thought, “what would Sarah do?” I have to thank you because it led me to create Cinnamon Maple Sweet Potato Toast, aka the best snack ever. Wow – what a fun event! I love the presentation of the food 🙂 I understand what you mean about the excess of food, and it’s frustrating that leftovers can’t be donated to a homeless shelter. I briefly worked as a waitress at a country club one summer during college, and there would be loads of untouched foods leftover from parties. They wouldn’t even let the staff take the pristine food home due to food industry laws. Bleh. Oh wow sarah I am so jealous I should have left work early to go there, it looks like so much fun. I would have been all over those cheesecake lollipops. I just realised I missed your birthday! I’ve been scrolling through some old posts (by the way, those cakes you made.. the strawberry icing.. omigod… so incredibly saliva-inducing) So happy belated birthday! 27 isn’t that old… although I’ll be 24 later this month and am freakin’ out a little so can absolutely understand the reservations..
Amazing food today – sensory overload! The dark chocolate cherry cupcake looks exquisite.. and I love little desserts. I want to try some malted milk now.. sounds really good! I feel the same way about these things. It’s sad that our country has the largest number of overweight people than any other nation, yet we still have people that go hungry everyday. It just seems so unbalanced! glad you had a good time 🙂 I love the little oven! Holy food Batman! It all looked good- even the seafood- and I am not a huge seafood fan. The pecan cinnamon buns and the lychee martinis looked the best to me. Omg what a cool event!! I’m amazed at the desserts. Love the little oven with the cinnamon buns, so cute! What a FANTASTIC spread of food! I’m am so jealous! The seafood and desserts were the best! It was great meeting you last night. The food was sooo gooooood! You were an awesome taster! I can’t believe you posted all this in such detail so fast! You take such great pics, and omg this post is making my mouth water. All that food looks insanely good, especially the desserts! I feel the same way often at events where there is tons and tons of food thrown out, when so many people truly need it, right in the neighborhood. The event looks great and the desserts–to die! how much fun!!!! I was really excited to see the name of your blog in the foodbuzz email this morning! !